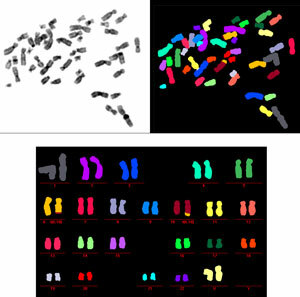 La Jolla, CA – Wielding a palette of chromosome paints, scientists at the Salk Institute for Biological Studies have taken a step closer to understanding the relationship between aging and cancer by visualizing chromosomes of cells from patients with a heritable premature aging disease known as Werner Syndrome. Image courtesy of Dr. Anna Jauch, Institute of Human Genetics in Heidelberg, Germany. The chromosomes were isolated from a cell taken from a patient with Werner Syndrome, a premature aging disease that is caused by the loss of the WRN gene. Painting each chromosome pair in a different color reveals the breakage and fusion of chromosomes (see chromosomes 6 and 10), which causes genomic instability and could explain the high incidence of cancer among individuals with Werner syndrome. Then they artificially supplied the cultured cells with one of two genes – either a functional copy of the WRN gene, which is mutant or nonfunctional in Werner Syndrome, or a gene encoding the protein telomerase, which elongates short or missing telomeres. After cells divided several times, their DNA was reexamined for the type of damage associated with both aging and cancer. Also contributing to this study were graduate student Colleen Naeger in the Karlseder lab and Anna Jauch, Ph.D., and Heidi Holgreve-Grez, Ph.D., in Heidelberg.